BOZEMAN, Montana, September 24, 2014 (ENS) – Native groups from the United States and Canada Monday signed a treaty to establish intertribal alliances to restore the American buffalo on Tribal and First Nations Reserves or co-managed lands in both countries. 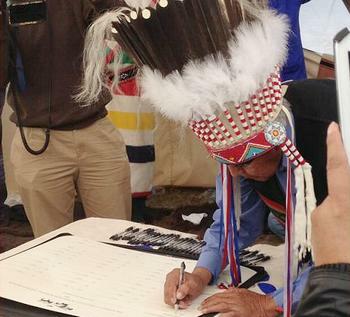 The Northern Tribes Buffalo Treaty was signed in Blackfeet territory in Browning, Montana. The event brought together members of the Blackfeet Nation, Blood Tribe, Siksika Nation, Piikani Nation, the Assiniboine and Gros Ventre Tribes of Fort Belknap Indian Reservation, the Assiniboine and Sioux Tribes of Fort Peck Indian Reservation, the Salish and Kootenai Tribes of the Confederated Salish and Kootenai Indian Reservation, and the Tsuu T’ina Nation. The treaty is the first among them in more than 150 years. The last peace treaty signed by these tribes, The Lame Bull Treaty of 1855, established a large common hunting ground and focused on preserving their cultures and ways of life. Collectively, these Tribes and First Nations own and manage about 6.3 million acres of grassland and prairie on both sides of the border – an area almost three times the size of Yellowstone National Park. Through their combined voice and a formal expression of political unity, their goal is to achieve ecological restoration of the buffalo on their lands, and in so doing to re-affirm and strengthen ties that formed the basis for traditions thousands of years old. Along with agreeing to work together for bison restoration and grassland conservation on tribal lands, the Northern Tribes Buffalo Treaty encourages youth education and cultural restoration among the tribes. “This is an historic moment that we hope will translate into a conservation movement among Great Plains Tribes,” said Keith Aune, Bison Program director for the Wildlife Conservation Society, chair of the IUCN Bison Specialist Group, and American Bison Society spokesman. For tens of thousands of years, buffalo shaped North American prairie ecosystems and linked Native peoples to the land. They affected plant communities, transported and recycled nutrients, created habitat variability that benefited grassland birds, insects, and small mammals, and provided abundant food resources not only for people but also for grizzly bears and wolves. Following their slaughter by Euro-American settlers in the 19th century, buffalo have been missing from these lands, resulting in ecological change and cultural loss to Native peoples. The arrival and expansion of Euro Americans across the northern Great Plains region resulted in more than a century of fragmentation, disruption of important ecosystem functions of native grasslands and relegation of wildlife to small parcels of protected lands. Dr. Leroy Little Bear, an elder with the Blood Tribe in Alberta and professor emeritus at the University of Lethbridge who attended the ceremony, told the “Calgary Herald” that the treaty has been in the works for about five years. 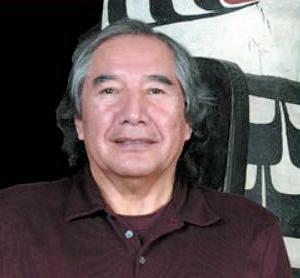 Little Bear is one of the proponents behind the Iinnii Initiative, named after the Blackfeet word for buffalo. “The Iinnii Initiative is an endeavor on the part of a large group of traditional elders to steer the younger generation back to a path of ecological balance,” said Little Bear. “Through the renewal and application of North American Indian paradigms, one discovers that sustainability, leaving the land as pristine as possible, and having humans fit themselves into the ecological balance are fundamental to the life-ways of Indian peoples,” he said. “But the buffalo is a major player in this ecological scenario. The near extinction of the buffalo left a major gap. The treaty on buffalo restoration aims to begin to fill that gap and once again partner with the buffalo to bring about cultural and ecological balance,” Littlebear said. The Buffalo Treaty is intended to create a lasting alliance among tribes of the northern Great Plains to engage northern Tribes and First Nations in a continuing buffalo conservation dialogue at intertribal meetings. The treaty advances an international call for the restoration of buffalo through media events and public relations efforts. After ranging across North America in the tens of millions in the 1800s, by the early 1900s, bison numbered less than 1,100 individuals. In 1905, President Theodore Roosevelt, William Hornaday of the Wildlife Conservation Society, then the New York Zoological Society, and others convened a group of stakeholders at the Bronx Zoo and formed the American Bison Society. ABS developed a new conservation ethic and helped save bison from extinction. In 1907, fifteen Bronx-born bison were sent by the ABS to the first big game refuge in the United States – the Wichita Reserve Bison Refuge in Oklahoma. Today, bison number in the hundreds of thousands in North America, and are found in state and national parks, wildlife refuges, and on tribal lands, but most reside on private lands as livestock. This has resulted in a disconnect between the bison and the native people and cultures that relied upon them for sustenance. 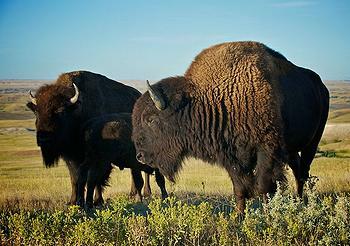 Only a small fraction of today’s bison are legally designated wildlife. Conservation efforts are underway to maintain viable bison populations and preserve the species. Garrit Voggesser, National Wildlife Federation national director of tribal partnerships said, “Tribes have managed bison herds for years and worked collaboratively to restore wild bison to the Plains. With the transfer of Yellowstone bison to the Fort Peck reservation in 2012 and to Fort Belknap in 2013, important first steps were taken to return wild bison to western landscapes.